Located in the heart, on the Rive Gauche, next to the Alma Bridge and just a few minutes walk from the Eiffel Tower, Mylene Caill and her friendly staff welcomes you to the City of lights. They look forward making your stay comfortable and a most pleasant experience. 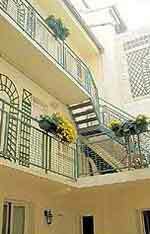 The Hotel Malar offers twenty-two affordable and quiet rooms overlooking a bright and flowered courtyard.